The high level language beloved of the retail sector, COBOL is 50 years old and still in widespread use. The economic pressure is driving thin margins in the retail sector. This in combination with increasing volumes and/or intensifying competition forces an imperative to reduce costs. Also, the large infrastructures of the retail units does not give them the flexibility to react swiftly to the rapidly changing business. The world of IT embraces and celebrates ‘new’ more than any other industry. New, creative innovations enjoy a meteoric rise in popularity and interest – seemingly overnight – for the potential benefits they can deliver to early adopters. What do smartphones, tablet computers, iPods, social media, and wireless networking have in common? They were all innovations of the last decade, and already we can’t imagine life without some of them. In a market crowded with new entrants each year, existing and established technologies have to fight to remain current, relevant and valuable. Already Java is considered to be getting old and applications written in Java are being labeled ‘legacy’. Research has revealed that an average person interacts with a COBOL application at least ten times a day. Gartner estimates put the number of lines of COBOL code in existence at over 200 billion, with the global investment in COBOL applications exceeding several trillion dollars. If COBOL were just deleted from airlines’ systems, flights could no longer be booked online, hotels could not handle reservation requests and cash registers at retail stores would simply not work. As a matter of fact, COBOL systems are responsible for transporting up to 72,000 shipping containers, caring for 60 million patients, processing 80per cent of point-of-sales transactions and connecting 500 million mobile phone users. It has been estimated that the average American relies on COBOL at least 13 times during the course of a routine day as they place phone calls, commute to and from work and use credit cards. However, the list is not limited to banking, retail, airlines, hotels, healthcare and mobile phones – it goes on and on. So how has COBOL, a fifty-year-old language, managed to remain a forerunner in the world of enterprise application development? According to Gartner more than 70 per cent of the world’s business is run on COBOL – the Common Business-Oriented Language, whose development dates back to 1959 when Rear Admiral Grace Hopper of the US Navy led a team working to create a high level language closer to English than the machine code previously used to program computers. Over the years COBOL has evolved to keep pace with technological developments, integrating with most modern technologies today. Most importantly, it’s retained many of its traditional strengths. As technology evolves, and new trends emerge, end users’ demands and expectations of the software applications are constantly changing. The emergence of social media and Web 2.0 applications like Facebook and new mobile platforms, such as iOS and Android, are driving users to expect a similar experience and accessibility from their business applications. Many of the mobile banking applications in use today run on data from mainframe applications written in COBOL years ago. Developments such as Software as a Service (SaaS) and cloud technology are breaking down geographic barriers and putting pressure on businesses to respond in a timely fashion to the changing user expectations and new competition. As organisations scramble to meet the new demands of the market, they expect their IT teams to deliver with constantly diminishing budgets. With this is mind, organisations are finding that the quickest, cheapest and safest option is to modernise their existing COBOL applications. According to Simply Hired, COBOL jobs listings increased over 100 per cent since November 2009. Although COBOL is not very popular with new applicants, the increase in job opportunities suggests there is a growing need for skills for application modernisation and virtualisation projects for legacy applications. 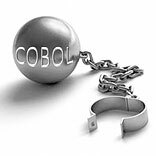 COBOL has a unique capability in that the same COBOL code can be re-used, as-is, and now extended to take advantage of, .NET and JVM without impact to the critical business logic. In the IT industry it continues to provide unrivalled features, such as the ability to express business logic accurately and the ability to do precise numeric calculations. COBOL continues to provide these benefits, but now offers new capabilities which will further accelerate business innovation. With the increasing trend of modernising existing applications as businesses are starting to recognise their value, demand will surge for IT professionals who understand how to bridge the two worlds. As a language, COBOL can be learnt by anyone, even non-programmers, in a matter of two or three weeks. The ability to understand existing COBOL applications and how they can be integrated with modern technologies to meet business demands will be increasingly valuable for anyone pursuing a career as an IT professional in the business application development space. COBOL is at the heart of the world’s business applications and development tools are being adapted, to work off-mainframe, modernise existing applications, and deploy COBOL.